Would you like to learn to play guitar in worship or improve the skills you already have? 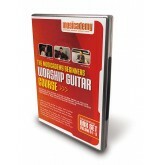 A whole years' worth of worship guitar instruction on three 2-hour DVDs plus advice and guest lessons from some of the best known worship leaders in the world. 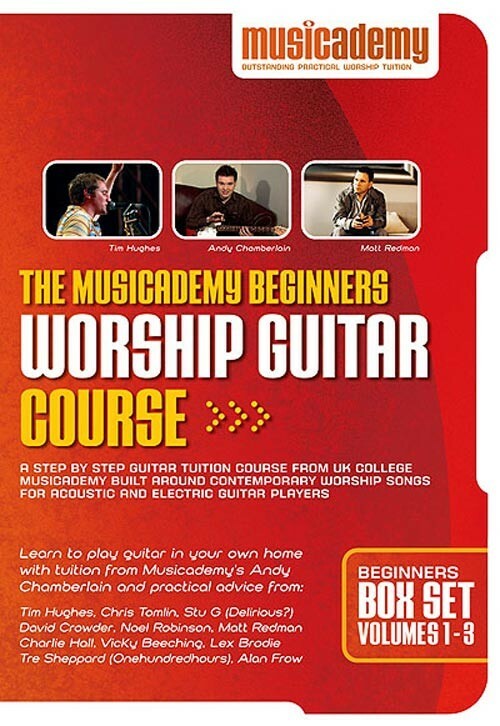 A really accessible set of guitar instructional DVDs for people wanting to learn to play guitar in worship taught by Andy Chamberlain, who has played guitar all over the world for worship leaders like Matt Redman, Tim Hughes, Vicky Beeching and Brenton Brown. The content of the lessons are a condensed version of the courses run by UK music college, Musicademy, along with practical advice and guest lessons from many well known worship leaders. Each DVD follows a step-by-step instructional programme built around contemporary worship songs that suit both acoustic and electric worship guitar. This is our Original Beginners Guitar DVD set. Click through for more information on the NEW Beginning Worship Guitar Course. And learn about the differences betweeh the two courses here. Building on the initial learning from volume 1, this volume teaches further chords and strumming patterns and also shows how to use power chords for a rocky sound. Claw hammer strumming, sounding bass notes on strings and varying your dynamics. New chord shapes further up the neck, using a capo, finger picking technique, playing with other musicians. Using the learning from all three volumes to play a wider variety of songs. Three DVDs in a box set with a total of 6 hours instruction. The equivalent to a year of one to one lessons. Songs used include Blessed Be Your Name, Here I am to Worship, My Glorious, Forever, God of Wonders, What a Friend I’ve Found, I’ve found Jesus, Majesty, History Maker, Better is One Day and Give Thanks to the Lord. Also featuring a clip form Onehundredhours "Stronger than My Heart" video and guest lesson from Stu G of Delirous teaching how to play the guitar part to Majesty . 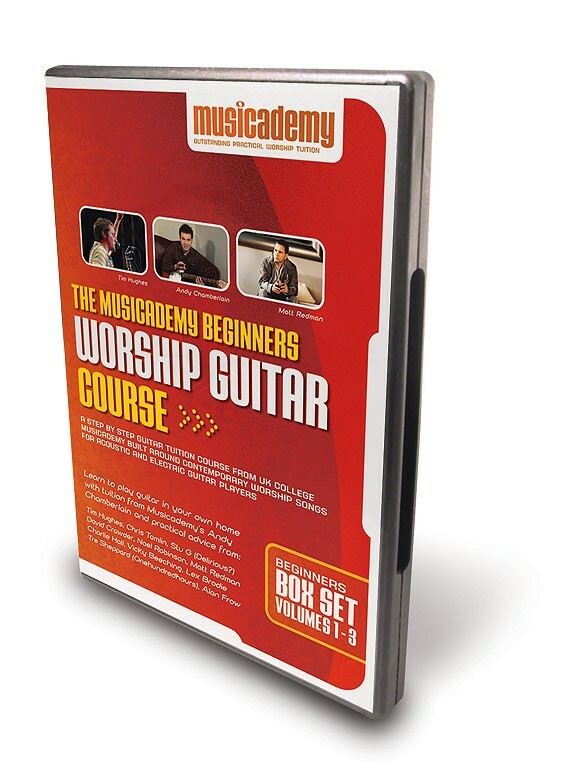 This Beginners series is suitable for complete beginners and will take you to a stage where you can play worship guitar confidently in a house group or small church setting. For existing players, volumes 2 and 3 are great for those who know a few basic chords and some strumming patterns but don’t yet play “power” chords, slash chords or chords further up the neck. Volume 3 also includes a complete guide to effective finger picking. After these volumes try the Song Learner series. Volume 1 is suitable for complete beginners who have never even picked up a guitar before. We often find that people who already know a few chords appreciate starting with volume 1 in order to make sure they fully understand the basics. Although not essential, lots of people find our DVD workbooks a helpful guide to use alongside the DVDs. With these you have the chord charts printed out beside you, rather than just on screen.The worknooks will help you work through the DVDs and turn each DVD volume into a 10 week course that really makes the most out of all the drum loops, backing tracks and interviews as well as showing you further songs to play using the chords and strumming patterns you have learnt. A great value. As a bass player trying to learn guitar, I had a little knowledge. I found the sections on strumming, finger picking and chord substitutions, quite useful. Will probably get the intermediate course in the future. Thanks! We wrote the chords on a gtuair then worked out the lyrics, I then recorded the backing track using Logic Audio' on a Mac. We then recorded each member of the class singing individually before putting them all together and mixing it. I had played guitar for over 7 years and couldn't progress much. Most of my difficulty was in strummng consistently. This DVD set was very helpful in allowing me to strum along with Christian songs I love. I am looking forward to buying the new set as I see it has much content added to it. Well done Musicademy. I am so thankful I am making a Musicademy sticker to put on my guitar case to give props for all the help. I for one, love the idea of sticking my case and personalized it. I found the beginner's dvd's very helpful for someone who has only had 2 years of guitar. 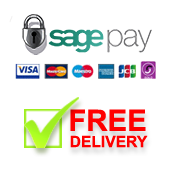 Everything is layed out in a very user friendly manner. The only thing is I wish that you would play the whole song with the chords being learned, that would be very helpful. We've taken that feedback on board and our new Beginning Guitar DVDs include a full play through and backing track. Very nice flow to the lesson experience - chord lesson, then a strumming pattern, a song, useful tips, then some real-life interviews. Not only am I learning a lot, I feel spiritually edified by listening to the interviews and going through the lessons. Really a unique product. This DVD has been very helpful to me as a long time worship leader, yet beginning guitarist. The production quality of the video is mediocre, but the quality of the content is very good. What took this over the top for me was the ability to see some of the most famous worship leaders in the world sharing plainly from the heart on a living room couch. To that point, I must that this kind of honest sharing makes the videos over the top awesome. I've been self-teaching myself to play the guitar on and off for the past 2 years now and learnt a couple of bad habits, this is the first time I've had something structured and specific to follow and boy I'm glad I bought this DVD set, Andy's a great teacher and guitarist, he helps beginners to progress to the point of being able to play in no time at all, give yourself 10-15 minutes a day for about 2-3 weeks and you should be able to play some of the more popular worship songs being sung in churches quite easily. Andy introduces some of the strumming patterns being used in today's popular songs sung in churches and if you stick to it you may actually find yourself playing and sounding like some of those records! Those drum grooves provided are also great accompaniment to your playing. Our church worship leader bought this and he said 'You must have a look!' It was great, easy to follow and super helpful! 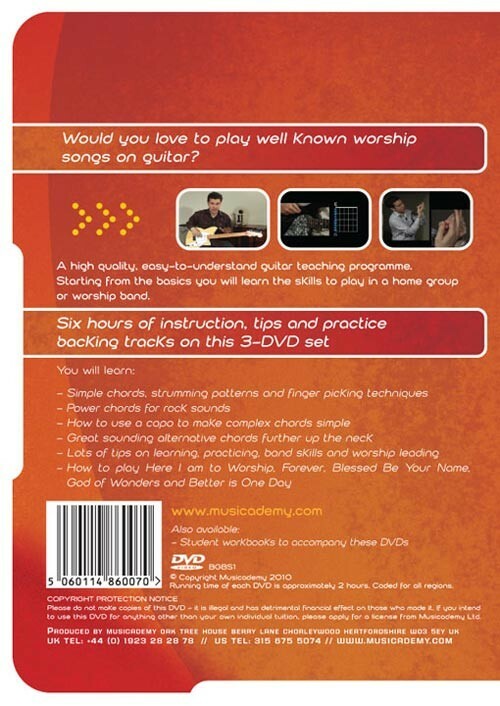 My church is using this dvd and although I watched a little bit, I thought it is a great way to start learning guitar! My wife bought me Beginners Worship Guitar less than two months after I'd got my 1st guitar. I'm no spring chicken so expected learning to be more difficult and was worried the tone would be too much like watching a yoof TV show. I needn't have worried. Andy is very easy to watch though I'm not the quickest of learners. The only thing I really struggled with was the audio practice tracks were I found it difficult to keep track of where I was meant to be up to. Anyway largely thanks to Andy's patience - no matter how many times I replayed a section he never seemed to get annoyed - I now lead worship in our little church.